"The only surprise is there aren't more violent protests in the Middle East", by Seamus Milne : http://www.guardian.co.uk/commentisfree/2012/sep/18/violent-protests-blowback-us-intervention?INTCMP=SRCH . Hey - what is you ?! Some kind of Anti-WAR, Peace Lover ?!! Stop being so Unamerican !!! "13 Powerful Images of Muslim Rage", by Max Read : http://www.informationclearinghouse.info/article32522.htm . we didn't displaced the natives peacefully ? yep - people have a nasty habit of resisting subjugation, right ? haven't you read the news? The attack in Libya was a planned terrorist attack. Not because of the video. Let's support moderate muslims who are struggling against extremists who want to derail the historic arab spring transition to moderate democratic gov. The Revolt of Benghazi’s Moderates: Will the Rest of Libya Follow? Furious about the assault on the U.S. consulate and the death of the American ambassador, the city rises against the local militias. By Steven Sotloff / Benghazi | September 22, 2012 | + inShare Asmaa Waguih — Reuters Asmaa Waguih — Reuters Demonstrators celebrate after burning a car they say was full of ammunition as they stormed the headquarters of the Islamist Ansar al-Sharia militia group in Benghazi September 21, 2012. Pro-government demonstrators stormed the headquarters on Friday and evicted fighters from the site in a sweep of militia bases in Benghazi. Ever since the end of the Libyan revolution last October, the militias—both secular and Islamist–that overthrew former leader Muammar Gaddafi have acted with impunity. They stole cars and confiscated buildings. They clashed with rival brigades using heavy weaponry they pilfered from military bases. But an interim government too weak and disorganized to confront the brigades was unable to persuade them to merge them into a national army and police force. And so frustrated residents in Benghazi decided to act on their own. As the U.S. and Libyan government scrambled to find a way to tame those very same militias allegedly behind an attack against the American consulate that left four dead including the U.S. ambassador to Libya, Benghazi residents took things into their own hands. In clashes that extended into the early morning hours, protesters overran the base of a militia suspected of masterminding the raid. The demonstrations started peacefully when 25,000 to 30,000 Benghazi residents poured into the streets shouting slogans such as “No to Terror, No to al-Qaeda” and “No to militias, no to brigades.” By nightfall, however, small groups of exasperated citizens raided militia compounds throughout the city. Friday’s march grew out of a civil society campaign to highlight a widespread condemnation of the attack that killed American envoy Chris Stevens and three others 10 days ago. “The Friday to Save Benghazi,” was advertised on television, radio and the internet. “We want to save Benghazi from the violence and get rid of the militias,”says protest organizer Muhammad Bujan. The demonstrators began their rally at a downtown hotel at 5 p.m. and marched several miles to al-Kish square where an Islamist militia was holding its own demonstration. Despite its denial of responsibility for the attack on the consulate, the Ansar al-Shari’a brigade had been roundly condemned as being behind the assault. About 3,000 Ansar supporters waved flags with the slogan “There is no God but Allah.” They also held up placards that read “We demand that National Conference members [Members of Parliament] and government officials renounce their American citizenship.” Some sported long beards and flowing robes favored by Islamist extremists. Others wore plaid button down shirts and jeans. Around 9 p.m. a group of about 80 men who were furious over Stevens’ killing marched on a militia base two miles away in the neighborhood of Sidi Hussein and soon stormed the building as militia fighters fled. Emboldened, they next overran the Ukba bin Nafi’a brigade that is affiliated with Ansar al-Shari’a. “We want them to know that Libya belongs to the people and not those with guns,” said Ahmad Obaidi as he joined others ransacking the base. As the crowds grew in size and confidence, they headed towards the Ansar al-Shari’a headquarters in Efoyhat, three miles away. But when they arrived, the group’s members refused to surrender and fired a number of warning shots in the air to try to disperse the protesters who refused to flinch. After 10 minutes however, the brigade accepted defeat, making way for the demonstrators to destroy the compound with rocks and pipes. The militia and Islamist phenomenon exists in other parts of the country. But Libyans there will find it harder to replicate Benghazi’s example. The city of Misrata with its dozens of militias is a state onto itself, running several prisons and preventing foreigners from entering. The city of Zintan has equally powerful brigades and has refused to turn over Gaddafi’s son Saif al-Islam to the national government. In both towns the brigades are admired for their role in the revolution and do not suffer from the militia backlash that has become widespread in Benghazi in the wake of the consulate attack. And as long as such brigades retain their societal support, it will be a long time before the scenes in Benghazi will be repeated in other parts of Libya. Pakistan government minister offers $100,000 bounty to kill movie maker. Did he offer $100,000 to help build some homes for Gaza residents ?. Did he offer $100,000 to help build some homes for Syrian victims ?. Did he offer $100,000 to help build some homes for Darfur victims ?. Why is the maker of that film a "slimeball idiot"? How can the "west" EDUCATE behind the Muslim wall of ignorance ? but they do not UNDERSTAND what freedom of speech really means. They may not want it for themselves, but they MUST understand that the whole world does not and will not "operate" the way they do. the recent anti-radical actions in Libya seem to show there is a movement towards "modernity" but how can we communicate that our freedom does not decrease theirs? Keep in mind the number of centuries Catholics & Protestants killed each other over similar issues. "He stood by the religious arguments he once made as a Brotherhood leader that neither a woman nor a Christian would be a suitable president." FYI - "just a statistic"
Nothing is "just a statistic". Who are these "Jews" and who are these "Arabs"? How do Iraqi Jews fit in since they're both Jews and Arabs? No - I dont have all of the names - but I found this statistic - do you find it wrong? In the aftermath of the 2003 invasion of Iraq, the Jewish Agency launched an effort to track down all of the remaining Iraqi Jews to present them with an opportunity to emigrate to Israel, and found a total of 34 Jews. Six chose to emigrate, among them Ezra Levy, the father of Emad Levy, Baghdad's last rabbi. Present estimates of the Jewish population in Baghdad are seven or eight. I find the statistic without context. Under what conditions and events were Jews killing Arabs during the noted period? Under what conditions and events were Arabs killing Arabs during the noted period? Under what conditions and events have Arabs killed Jews during the noted period and how many? And under what conditions and events have Jews killed Jews during the noted period and how many? Nor is Iraq (Sunni versus Shiite) the only place where Muslim violence against Muslims rages unabated. There is Darfur in Sudan, Somalia, Afghanistan, Kashmir, Algeria until recently, and hotspots in Iran, Bangladesh, Pakistan, Indonesia, Nigeria, Uzbekistan, Palestine, Morocco, Egypt, Saudi Arabia and Lebanon. Muslims killed 80,000,000 Hindus to conquer India Will Durant, the famous historian summed it up like this: "The Islamic conquest of India is probably the bloodiest story in history. It is a discouraging tale, for its evident moral is that civilization is a precious good, whose delicate complex of order and freedom, culture and peace, can at any moment be overthrown by barbarians invading from without or multiplying within." Koenraad Elst , the german historian writes in "Negation in India" The Muslim conquests, down to the 16th century, were for the Hindus a pure struggle of life and death. Entire cities were burnt down and the populations massacred, with hundreds of thousands killed in every campaign, and similar numbers deported as slaves. Every new invader made (often literally) his hills of Hindus skulls. Thus, the conquest of Afghanistan in the year 1000 was followed by the annihilation of the Hindu population; the region is still called the Hindu Kush, i.e. Hindu slaughter. The Bahmani sultans (1347-1480) in central India made it a rule to kill 100,000 captives in a single day, and many more on other occasions. The conquest of the Vijayanagar empire in 1564 left the capital plus large areas of Karnataka depopulated. And so on. As a contribution to research on the quantity of the Islamic crimes against humanity, we may mention that the Indian (subcontinent) population decreased by 80 million between 1000 (conquest of Afghanistan) and 1525 (end of Delhi Sultanate).. So then, the claimed figure pertaining to Arabs really wasn't simply about Arab on Arab killing. Apparently, it's about Muslim on Muslim killing since places like Liberia, Nigeria, Chad, Algeria, Somalia, Sudan, Western Sahara, Turkey, Iran, Tajikistan, and Kurds, are not Arab. Really? It's diversion to clarify what a given statistic actually refers to? So then, just what is it that this clarification is supposedly diverting from? as awful as it is, it's still OK to laugh. defending these savages must be excruciatingly difficult, even for the most dhimmwitted, self-loathing slave to politically correctness. Getting members of different religions to fight each other is an ancient strategy of empires, "divide and conquer", going back to the Roman empire and beyond. Its still a popular strategy with the rulers of today's financial empires. 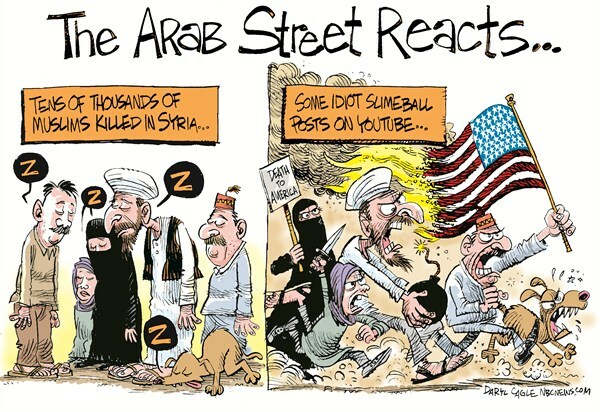 I don't think the "muslim street" needs much prodding to go berserk. they mostly kill each other. That's a pretty broad statement for the whole Islamic world, to me it just sounds like prejudice. The elites manipulate us through such prejudices, Muslims and westerners alike. They think there are too many of us on this world, too many for them to control, and would be quite happy to see us wipe each other out through a nuclear WWIII. Some say this is brewing in the middle east right now. It would start out as a war between Israel and the US vs. Syrian then Iran, and inevitably draw Russia and China into it. When the nukes come out, the elites would hide in their bunkers until the fall-out settles, than come out to reclaim whats left of the world for themselves. I am not too concerned about Iran attacking Israel, it would be suicidal. If they did so, their country would be flattened to the ground in retaliation by the US, or who knows what coalition. Whether or not they are maniacs or fanatics, I don't think they would be that crazy to ensure the complete destruction of their own country. arabs have no problem murdering other arabs. Rather than discuss the difference, lets discuss the similarity, which probably is that the both Catholics were and the Muslims are being manipulated by elite figures behind the scenes. A financial oligarchy is behind the scenes. "A financial oligarchy is behind the scenes." In Muslim countries? I find it hard to believe there is any more powerful force than Islam. A good question, happy to elaborate. The western financial oligarchy began manipulating the Islamic world between two and three hundred years ago when the British East India company began the process of colonizing India. At that time, India had a significant Muslim population along with the indigenous Hindus. Muslims had in previous centuries invaded and conquered much of India, so there was significant resentment among the Hindus against them. The British East India company, which had inherited its imperial tendencies from the Venetian empire, undertook a divide and conquer strategy to get the Muslims and Hindus fighting against each other, in order to weaken themselves, allowing the British to take over India, city by city. The British played upon the mutual prejudices and resentments that Hindus and Muslims felt for each other, in much the same way that the media is used to incite Muslims and westerners against each other these days. Although we don't recognize a British Empire existing in our times, its remnants still exist as a global "financial empire" with major bases in the City of London financial district and on Wall Street. This financial empire has major influence on Islamic institutions such as the Al Jazeera news services, the Muslim Brotherhood, and on the intelligence agencies of all Islamic countries through the CIA and MI6. They stir up the Muslims by presenting information antagonistic to westerners in the Middle East, and similarly antagonize us against the Muslims through our media as well. The divide and conquer strategy that was once used to subdue the vast nation of India is now being used on a global scale with the intention of subduing the entire world. sorry to see you've stifled your view of reality with political correctness or some other kind of blindness. "elites" have nothing to do with thousands of bored idiots with an inferiority complex getting so easily riled up to commit violence over nothing of any importance whatsoever. the video was cover for the libya attack, and the cover lie has now caught fire anyway in greater cavemanistan. and now 17 are dead. like I said, they mostly kill themselves. you've stated zero connection between "elites" and the protesting lunatics I'm talking about. also, the idea that "elites" would ever be setting themselves up to live in a post-apocolyptic world is absurd, ridiculous, and delusional. if you honestly believe that, you might be mentally ill.
My view has nothing to do with political correctness, but rather is simply based on history. The western elites began manipulating Islamic hatred when the British empire colonized India over 200 years ago. Muslims and Hindus were incited to massacre each other, allowing the British to take control once they had been significantly weakened. Ever since then, the British empire, and its remnants today, including Wall Street, have been manipulating the Islamic world through influence of intelligence agencies in Islamic countries as well as the mass media in the middle east. The same manipulation is extended to westerners now. You are obviously an example of a pawn in this great game, as is evidenced by the hatred you express in your post. The connection between economic collapse and world war has a clear precedent in history, that of the great depression and WWII. If you don't study history you will be doomed to repeat it. Honestly that is true and all but there is something seriously wrong with these people. The Islamic population is very big, and I would guess that most of it, like any population, is mostly moderate. I have Muslim friends who are perfectly normal people. We are just exposed to the ones who are fanatics through our media which, owned by wealthy people that profit from wars, hopes to incite us against them for the purpose of starting another religious war. "The western elites began manipulating Islamic hatred..."
oh, please. it is ALWAYS someone else's fault. savages go batshit over a video and some people just can't bring themselves to condemn savage behavior without a meaningless assload of excuses and swerves. "the hatred you express in your post." pc zombies like you always call honesty "hatred." if you were sane, you wouldn't see any hatred in my post. but you are, so you do. finally, your take on history is comical. I do condemn savage behavior, yours is quite contemptible. If you're committed to a simplistic view of history, fine, knock yourself out. You can't expect everybody to share your commitment to ignorance however. You can't even write an insult correctly. You say "If you were sane" then continue to say "but you are". "elites" have nothing to do with thousands of bored idiots with an inferiority complex getting so easily riled up to commit violence over nothing of any importance whatsoever. Few people realize our devious plans to launch a 3rd world war and to save ourselves by hiding in our specially constructed anti-nuclear bunkers. People are baffled because they work in factories for us making our fast cars, jets, and boats. They serve our wine, beautify our gorgeous women, count our money, and shine our shoes. They do not believe we want to give it all up to hide like rats in our holes for hundreds of years until the nuclear fallout has ended. They look at Chernobyl and see that the land is still polluted because the half-life of nuclear elements is so long. They believe this is peanuts compared to a 3rd world war. Mhahahaha!!! They don't understand that we have created sophisticated nuclear waste eating machines that will clean up the mess in a matter of weeks! And, when we come out of our caves, we will have the world to ourselves!!! Mhahahaha!!! And, don't be fooled by thinking we won't have poor slaves anymore to shine our shoes, fix our cars, serve our wine and cigars, and beautify our gorgeous women! No! We have slaves in the underground. You see, we have made the reptilian overlords our slaves. They are now our reptilian underlords. They will replace all you puny humans and work for us! Because you have revealed our devious secret, you must be stopped. You can either join us in our bunkers, or we will hunt you down to make sure you do not speak against our plans to overtake the world! Like I'm really scared, come and get me. I'll warn you, I'm under the protection of an ancient Chinese secret society. Besides, you can't really scare me much more than a nuclear WWIII. You know, in all the conspiracy theories I've ever heard from the current "slaves" about this...er...um...plot...not ONE of them has been creative enough to even come up with "nuclear waste eating machines"...let alone solve the problem of who the "new slaves" would be. How about these Muslims. You got a problem with them also?